With Venezuela set to begin their latest quest to qualify for their first-ever World Cup, Hispanospherical.com looks at the burden of expectation carried by manager Noel Sanvicente, the loss of the talismanic Juan Arango and provides an overview of those likely to take to the field against Paraguay and/or Brazil. 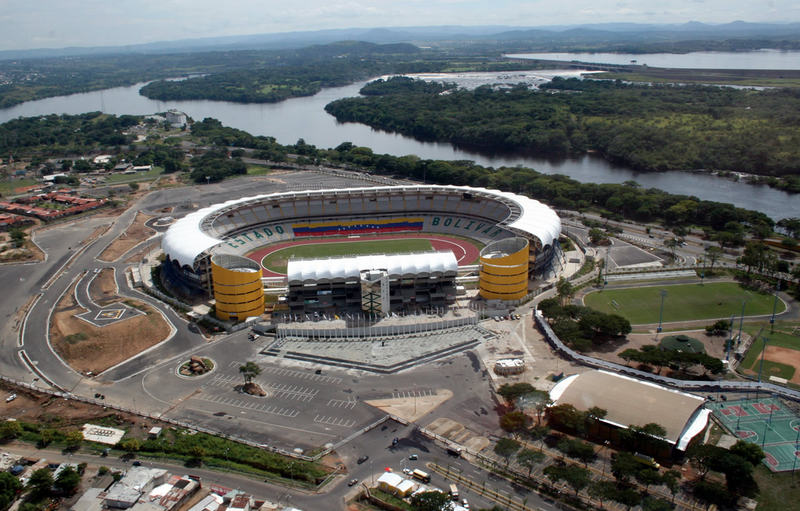 Thursday 8 October 2015 – Estadio Cachamay, Puerto Ordaz, Ciudad Guayana, Bolívar State. Tuesday 13 October 2015 – Estádio Plácido Aderaldo Castelo, Fortaleza, Ceará. ‘I’m not here to win Copa América, I’m here to get us qualified [for the next World Cup]. If not, it’s a failure’. 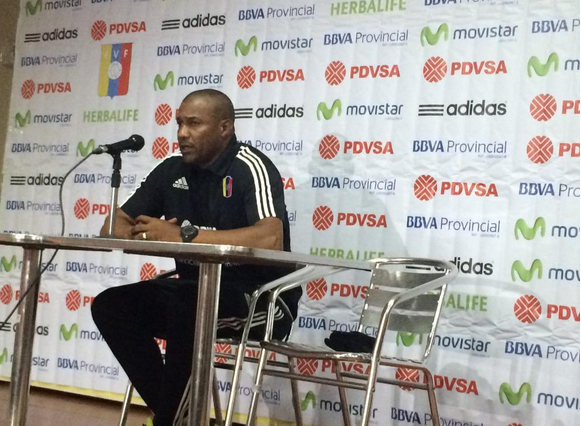 Back in June just days before the Chile-hosted tournament kicked off, Venezuela manager Noel Sanvicente forcefully set out the terms on which he believes his tenure will be judged. In the four months that have since passed, the rod ‘Chita’ appears to have built for his own back has only enlarged. True, there was the expectation-escalating euphoria of mugging Colombia 1-0 on that frenetic opening sunday in Rancagua, but just seven days later La Vinotinto were booking their flights home. Having been vanquished by both Peru and Brazil, Venezuela’s group-stage exit marked their worst performance in the competition since 2004. However, when the squad was reconvened last month for two home internationals, the largely identical line-ups that were fielded had the chance to vindicate the views of many fans; namely, that in June they had merely been unfortunate victims of a tough draw as well as a certain refereeing decision/one player’s moment of ill-discipline (depending on who you talk to and on which day of the week). Such sentiments were soon to evaporate, which is more than can be said for the rain at Estadio Cachamay, home of Mineros de Guayana. Indeed, following an eyebrow-raising 3-0 trouncing meted out by Honduras, the subsequent online storm that it sparked was paralleled in the weather conditions at this deceptively photogenic ground. Subsequently the second game against Panama had to be delayed for over 20 minutes before commencing in what were rather A & E-friendly circumstances. Swashbuckling, it was not, though both teams were not short of opportunities to make a splash. Two opposition players had to be substituted off within the first 25 minutes and had Salomón Rondón not tapped in an injury-time equaliser, he and his compatriots may have opted against emerging from the swamp. Before these encounters, Sanvicente and several others in the camp had emphasised the importance of winning their home games, given the lengthy distances and varied playing conditions they will face in CONMEBOL qualifying. This week, as well as pointing favourably to the example of Ecuador last time around, he has voiced a similar outlook ahead of his country’s opening World Cup qualifying match with Paraguay: ‘For any team, the first match is all-important. To qualify, this match must be won.’ Such comments grant him little room to manoeuvre should things have gone awry just 90 minutes into a two-year campaign. However, they do testify to both his winning mentality (seven domestic titles as coach) as well as the expectations that now come with the job. His predecessors have a lot to answer for. The cumulative work from 1999-2013 of José Omar Pastoriza, Richard Páez and, in particular, César Farías enabled Venezuela to belatedly emerge as a force within the region, regularly attaining ever-greater heights. Under Farías, they recorded their best ever Copa América performance (4th in 2011) as well as, positionally at least, their highest finish in a World Cup qualifying campaign (6th of 9 teams for Brazil 2014). Given this backdrop of rapid transformation, any deviation from the seemingly inevitable march of progress runs the risk of provoking the collective ire of fans. The early Copa exit, compounded by the subsequent friendly defeats, has raised significant doubts in the minds of many as well as given further ammunition to those with long-standing grievances with the team’s displays since Sanvicente took over in July 2014. Midfielder Luis Manuel Seijas acknowledged this disgruntled element after the Honduras debacle, though was evidently not keen on any kind of rapprochement: ‘We’re surely getting crucified, but let’s hope that in October, when we win in the first match, they won’t get in the victory bus with us’. Alternatively, if worst comes to worst, they should withhold their home-made torture devices for the time being and then ‘[c]rucify us in October if things don’t go well for us.’ Two straight losses against Paraguay and Brazil and the mob will not need any encouragement. One of the consistent complaints during Sanvicente’s reign has been the lack of effective attacking play and, as a consequence, goals. Overall, just 13 (15 unofficially) have been scored in as many games. However, apologists for the current regime will be keen to recall that things were no better during Farias’ reign, with the team only managing to score 14 in the 16 games of their admirable 2014 World Cup qualifying campaign. Yet, Sanvicente has got a task on his hands if he is to even match that tally, particularly as one key architect and supplier of those goals has recently confirmed that he will not be there to assist on the road to Russia 2018. Video of all but one of Juan Arango’s goals in World Cup Qualifying games (YouTube). His final one against Bolivia can be viewed here. A 15-minute run-out at the Estadio Cachamay on the night of the Panama game was no way to end the 16-year international career of the most-capped, highest-scoring and, quite simply, greatest player in Venezuela’s football history. Alas, that was, by choice, the end of the road for Juan Arango, the man who future generations should easily be convinced into believing inspired the cliché ‘cultured left foot’. In the next two years there will be far fewer left-footed pearlers gliding through the air, far fewer pinpoint set-pieces and far fewer nonchalant flicks and exquisite through-balls. Some doom-mongers fear there could even be none of the above; this is something no convert to the CONMEBOL cause wishes to hear. Aside from the goals and assists, the departure of La Zurda de Oro also deprives the side of a certain confidence and appeal to outsiders that is difficult to find elsewhere in the squad. This is, after all, the man who blithely informed German newspaper Bild that he is, in fact, a better free-kick taker than Cristiano Ronaldo; an assertion backed up by many observers, including one of the most august global football sources. Appreciation for his talents is such that even the Bundesliga’s official YouTube channel temporarily removed its impartiality cap to endorse El Huracán del Caribe as their favourite player in a much-viewed video of all his goals at Borussia Mönchengladbach (2009-2014). Furthermore, earlier this year, one of his team-mates from this period, a certain Marco Reus, paid tribute to him in an interview; he is far from alone in his admiration. Following the dismal day out at the waterpark with Panama, his Vinotinto companions joined him at a teary-eyed press conference and soon afterwards were quick to express their gratitude and respect for El Capi, at times approaching idolatry with their praise. Arango had announced that he had been mulling over retirement for a while and that, ultimately, he did not possess the motivation for another lengthy campaign and it was time to give others a chance. Talk of the post-Arango era has steadily increased ever since his 2014 move back to Mexico with Xolos de Tijuana following a decade in Europe shared between Spain and Germany. Undoubtedly, he was slowing down, tracking back less and being less of a decisive factor in games. However, as he remained an on-field influence right up until his last competitive game, the claims that his iconic status combined with his diminishing mobility made him a hindrance to reshaping the national team’s attack still needs some visible supporting evidence – this may take some time to emerge. Indeed, though Venezuela could only manage two goals at Copa América, Arango played a major part in both. Against Colombia, it was his hooked cross on the turn that Alejandro Guerra nodded across for Rondón to head in and against Brazil it was one of his trademark free-kicks – one of only a few he was actually allowed to take – that was parried back for Miku to halve the deficit late on and cruelly get everyone’s hopes up. . Furthermore, in the last qualification cycle, he scored three goals – including this stunner against Ecuador – and set up some other memorable ones, including Fernando Amorebieta’s history-making winner against Argentina and Rondón’s late equaliser away to Uruguay. Who then, could possibly fill his boots? No-one, is the gut reply. Instead, it seems Sanvicente will attempt to ensure that those in the attacking positions can combine to offer something different which adds up to more than the sum of their individual parts. Guerra and Ronald Vargas were the two wide-men who flanked Arango in June, though based on Sanvicente’s press comments as well as sources close to the side, they may not be reprising their roles against Paraguay. Indeed, renowned journalist Humberto Turinese, who regularly travels with the squad, has stated that Venezuela will line-up in a 4-2-2-2 formation, Rondón being joined up front by Juan Falcón with César González and Jeffrén Suárez playing in the space behind. Falcón, a forward at Metz who was not even in the Copa squad, won some praise for his lively display against Panama after he came on as a first half-substitute for Christian Santos, the NEC Nijmegen attacker who is also in this squad and is currently one of the top-scorers in the Eredivisie with 5 goals in 8 games. 33-year-old González, a regular under Farías who had to make do with being a substitute in June, appears to have won a start off the back of his scintillating domestic form with Deportivo Táchira – 7 goals in 8 games. Jeffrén, by contrast, only made his international debut last month just as Arango was departing. One in, one out, some might say. The 27-year-old graduate of Barcelona’s La Masia academy and erstwhile Spain youth international finally agreed to play for the country of his birth and is doing well rebuilding his career at Belgian side KAS Eupen following some injury setbacks. Needless to say, if such an attack does emerge from the tunnel then it is quite a bold risk from Sanvicente, who has named very similar line-ups for the past five games. While Turinese is a respected figure, it must be noted that other outlets, such as the popular Twitter account Mister Vinotinto, are anticipating a different line-up. Whatever the reality, should Sanvicente opt otherwise or perhaps need to make further adjustments after the first whistle has been blown, then along with Santos, Guerra and Vargas, there are at least two other options at his disposal. For one, there’s Josef Martínez, a slippery. versatile attacker who many in his homeland feel is a definite star for the future but who has struggled to really nail down a regular place at Torino. A second possibility is another much-vaunted prospect, 20-year-old Jhon Murillo, who is on loan at Tondela in the Portuguese top-flight from Benfica. The Lisbon giants signed him on a five-year-deal following two eye-catching seasons at domestic club Zamora. Over the course of two years, observers can expect to see at least a few different organisational and personnel changes in this area of the field. Outside of the current squad, there is a handful of other players who could well be in with a chance, with two names in particular standing out as long-term prospects. Firstly, the injured Rómulo Otero, a jinking playmaker/wide-man whose set-pieces have at times drawn comparisons with those of Arango; a few months back he made his long-awaited move away from Caracas ending up, somewhat surprisingly, at Chilean outfit Huachipato. There is also 21-year-old Juanpi who, to the chagrin of some, Sanvicente feels needs a bit more first-team club experience. Indeed, while he may not always be named in the Málaga line-up, he does already have substitute appearances at the Bernabéu and Camp Nou under his belt this season. Time will tell whether he is best-suited to an attacking-midfield or a more reserved, deep-lying role. Despite the focus on the forward problems, the defence is certainly not without its flaws, conceding at a rate of two per game under Sanvicente. However, although they have been porous in non-competitive encounters, they only let in three in as many matches at Copa América, with the clean sheet and solid, disciplined performance against Colombia earning them plaudits around the world. While there are still some debates to be had here, things are, at the moment at least, a little more settled in this area. Against Paraguay, Alain Baroja will definitely be in goal, with Málaga’s tenacious Roberto Rosales at right-back and Sion’s Gabriel Cichero at left-back (though the suspended Fernando Amorebieta could return for the Brazil game). In the centre of defence will be the towering Oswaldo Vizcarrondo of Nantes, though Thailand-based Andrés Túñez may lose his spot to 34-year-old Franklin Lucena, if Turinese’s reporting is accurate. If this is the case, Túñez may be paying for his roles in the goals of Brazil’s Thiago Silva and Roberto Firmino – both of whom, incidentally, are not in the Seleção squad – in June as well as some errors in September’s friendlies. On a related note, the defence as a whole should also be pleased that Robinho – who had a great game three-and-a-half months ago, setting up the first goal – has not been called up; Chelsea’s Willian, however, who jinked past Rosales to cross in for Firmino to tap in the second, is. In front of the back four will surely be the usual partnership of Seijas and new captain Tomás Rincón. Many will be looking to El General, currently with Serie A side Genoa, to assert his character on all his colleagues and instil within them the determination and mental toughness that he has long displayed, most notably in the run to the semi-finals of 2011’s Copa América. He has worn the armband on many occasions in the past and now with the official designation, he can be proclaimed with firmer justification to be the most important player in the Venezuelan ranks. Indeed, while Rondón may ultimately grab more headlines, with goals not anticipated to fly in with any regularity, Rincón’s leading role in repelling attacks and communicating with the defence-minded players around him will be key. To have any chance of prospering in this qualifying campaign, similar tactics, work-rate and organisation to those witnessed against Colombia will surely be essential. If Rincón and co. can successfully thwart, the onus will be on Rondón and whoever is immediately behind him to capitalise. Ultimately, to state the blindingly obvious, it is not going to be easy for Noel Sanvicente. As well as the issues raised here, he must contend with the quality of the CONMEBOL region being arguably at its strongest in living memory as well as the additional problem of having Brazil return to the qualification trail to compete for what are potentially five World Cup places. Indeed, their south-easterly neighbours, now managed by Dunga, are the only team left in the confederation that Venezuela have never beaten in a competitive match. Only the eternal optimists are considering this record to be broken next Tuesday. For now, the attention in the camp is narrowly focused on Paraguay, against whom in the same fixture the campaign for Brazil 2014 officially ended following a frustrating 1-1 draw in westerly San Cristóbal. That occurred on Venezuela’s final matchday; if Sanvicente’s pre-game words are to be taken at face-value, a failure to beat La Albirroja this time around could mean he feels their quest for Russia 2018 is all-but-over at the first hurdle. Such an outcome would be disastrous for morale and the pressure on the coach and players would undoubtedly increase. Still, as long-time followers of football in this continent know, if a week is supposedly a long time in football, then try two years. Players can gradually emerge, teams can belatedly gel and circumstances can change. Whatever happens this week, it is going to be quite the long-distance assault on the senses. Hispanospherical.com hopes you manage to remain in one piece and stick around to see it to its conclusion. Goalkeepers: Alaín Baroja (AEK Athens), José David Contreras (Deportivo Táchira), Wuilker Fariñez (Caracas FC). Defenders: Fernando Amorebieta (Middlesbrough, on loan from Fulham), Wilker Ángel (Deportivo Táchira), Gabriel Cichero (Sion), Alexander González (Young Boys), Roberto Rosales (Málaga), Andrés Túñez (Buriram United), Oswaldo Vizcarrondo (Nantes). Midfielders: Rafael Acosta (Mineros de Guayana), Arquímedes Figuera (Deportivo La Guaira), César González (Deportivo Táchira), Alejandro Guerra (Atlético Nacional, on loan from Mineros de Guayana), Franklin Lucena (Once Caldas, on loan from Deportivo La Guaira), Jhon Murillo (Tondela, on loan from Benfica), Tomás Rincón (Genoa), Luis Manuel Seijas (Santa Fé), Ronald Vargas (AEK Athens). Forwards: Juan Falcón (Metz), Josef Martínez (Torino), Salomón Rondón (West Bromwich Albion), Christian Santos (NEC Nijmegen), Jeffrén Suárez (KAS Eupen). Note: Fernando Amorebieta is suspended for the first game against Paraguay. This entry was posted in Venezuela National Team and tagged Alain Baroja, Albirroja, Andres Túñez, Brazil, César González, CONMEBOL, CONMEBOL World Cup Qualifiers, Fernando Amorebieta, FIFA World Cup, Franklin Lucena, Humberto Turinese, Jeffrén Suárez, Jhon Murillo, Juan Arango, Juan Falcón, La Vinotinto, Latin America, Latin American Football, Neymar, Noel Sanvicente, Paraguay, Ronald Vargas, Russia 2018, Salomón Rondón, Seleção, South American football, South American World Cup Qualifiers, Tomas Rincón, Venezuela, WBA, West Brom, West Bromwich Albion, Willian, World Cup, Xolos de Tijuana on October 8, 2015 by hispanospherical.